Mr. Romeo Bugyei, the Chief Executive Officer (CEO) of IT Consortium Limited, has called for closer collaboration between government, regulatory bodies and FinTechs to create awareness on the pension schemes for the informal sector. He said in order to achieve successful financial inclusion, FinTech companies must be supported to enable them efficiently deliver Digital Financial Services (DFS) to Ghanaians. 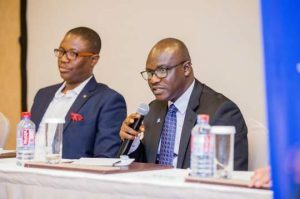 A statement issued in Accra quoted Mr Bugyei as making the call at a stakeholder forum co-hosted by the Ghana Technology Chamber and the Ghana Chamber of Telecommunications. “FinTech companies run recurrent costs regardless of whether a transaction goes through or not. We need to push informal pensions whether it is to a farmer, house help or market woman and that makes it difficult,” he said. He said when the National Pensions Act (2008) was put together, there was no allocation made for other channels that support the work of custodians and fund managers like the Telcos and FinTechs, hence, making it difficult for them to make meaningful revenue to support their operations. “If the regulator can come in with a specific fee for our channels, it will help a lot,” he added. He said last year, IT Consortium, in collaboration with MTN Ghana and United Pensions Trustees introduced ‘My Own Pension’, a Mobile Money driven pensions platform, the first of its kind in Ghana and Africa. The MOP is a three-tier pension scheme tailored to resolve the problem of financial insecurity among pensioners aimed at providing Ghanaians, especially, those in the informal sector, a simple and convenient way to save and make voluntary pension contributions. Mr. Bugyei said although his organization has gotten very little out of its operations in the digital pensions space, they were determined to develop more products that promote financial inclusion, while working closely with other stakeholders within the sector. He advised operators within the DFS space to seek the backing of regulators of the industry, when designing products and services for public use. The CEO said this would serve as an assurance to end-users that their finances and other investments were secure following the recent financial sector troubles in the country, which have affected public trust. Mr. Kenneth Ashigbey, the CEO of the Ghana Chamber of Telecommunications, said the chamber was keen on the development of the DFS sector and stressed on the need for financial technology businesses to stop being passive consumers of legislation but they should be able to challenge portions of the Payments Systems and Settlement Bill they feel were not right. Mr Kwame Oppong, Financial Sector Specialist at CGAP, emphasized the call by Mr Ashigbey for FinTech companies to be more actively involved in shaping legislation. “As long as the industry continues to collaborate, understand the issues and make a determined effort to engage our government to make sure that the change we need happens, we will be in a good place,” he added.